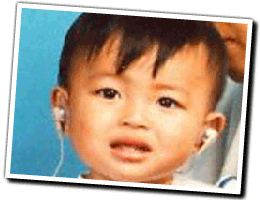 The Sound hearing 2030 initiative was first launched at the first general Body Meeting in Bangkok, on the 4th of October 2005, with the support of WHO SEARO, CBM, and focal persons from the SEA countries. 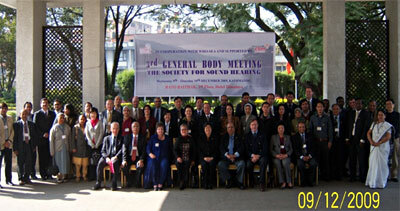 The organization was first called the South East Asia Forum for Sound Hearing. On the 12th of December 2008, it is registered in New Delhi under the Societies Registration Act of 1860 with the name "Society for Sound Hearing". Its secretarial office is set up at the Dean's office of the campous of the Maulana Azad Medical College, Bahadur Shah Zafar Marg, New delhi -110002. Three General Body (GB) meetings and eight Executive Committee (EC) meetings of the Society for sound Hearing have been in the first term of the organization. The 1st GB meeting along with the launch of the Sound Hearing 2030 initiative, and appointment of the first Executive Committee members, was held in Bangkok, 4th - 5th October 2005. The 1st EC meeting was held in New Delhi, 23rd to 24th March 2006 at the WHO SEA office, ad openend by Acting Regional Director of WHO SEARO, Dr. Poonam Khetarpal Singh, who reiterated the commitment of WHO towards the cause of Deafness & SOUND HEARING 2030. This meeting was concluded by announcement regarding the commencement National Committee for Control of Deafness in India by the Minister of Health and Family Welfare of India. The 2nd EC meeting was held in Bangkok, on the 9th - 10th October 2006. The Healthy Ear District (HEARD) and Less Noise Cities concepts were discussed as well as other Sound Hearing 2030 programs. The 3rd EC meeting was held along with the The '1st International Conference on Prevention & Rehabilitation of Hearing Impairment' in Beijing, on the 25th - 27th of April 2007. The 2nd GB meeting along with the 4th EC meeting was held at Jakarta, Indonesia on the 14th - 16th of December 2007. The meetings were accompanied by a Symposium on Childhood Deafness attended by over 100 local participants and experts from all over the world. An exhibition of awareness materials on community ear and hearing health care was oranized. The meeting was also accompanied by the launch of the Indonesian National Committee, signed by the Minster of Health of Indonesia. The 5th EC meeting of the Society was held at Dhaka, Bangladesh in on the 27th - 28th May 2008. The meeting saw the launch of the Bangladesh National Committee for Prevention of Deafness. It was also accompanied by a Symposium on Prevention of Hearing loss for the benefit of the local ENT community. 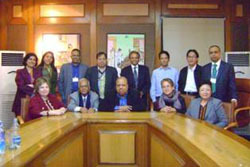 The 6th EC meeting of the Society was held at the Maulana Azad College, New Delhi on the 19th to 20th of January 2009. It was accompanied by an expert committee meeting to develop guidelines regarding 'Infant hearing screening in India', in partnership with WHO India office and Govt. Of India. A workshop was held in Bangalore, involving the core group of the EC, to discuss the next five year plan (2010-2014), in collaboration and consultation with CBM SARO (N) office and several experts as advisors, on the 24th - 26th of March 2009. The 7th EC meeting was held in Rayong Thailand, 8th - 9th August 2009. Registration issues were discussed as well as the five year plan and the upcoming GB meeting planned. The 3rd General body meeting of the Society along with the 8th EC meeting was held at Kathmandu, Nepal on the 9th - 10th December 2009. This was preceded by an 'Intercountry Consultative meeting' to develop Guiding Principles for Infant hearing screening in the SEA region. The meeting was attended by experts from all over the world. A symposium on Screening for Hearing Loss in Children was also held at the same time, and was attended by many local participants including ENT doctors and audiologists. A photo competition and exhibition of the hearing impaired was held and rendered a lot of interest.